Anyone who’s been reading the Movoto Real Estate Blog for the past few months knows that I’m kinda into a lot of geeky stuff. I mean, the very first thing I wrote was about building a house out of Tetris pieces. Oh, and there was that time I tried to connect with my people by ranking America’s nerdiest cities. Anyway, of all my nerdy pursuits, I’d have to say that my love of Teenage Mutant Ninja Turtles is near the top of the list. I’m a bona fide Turtleholic (yes, that’s a thing, and I think I just made it up). Unlike a lot of people my age who grew up in the ‘80s and ‘90s, I actually got into the Turtles by reading the original Mirage Studios comics by Kevin Eastman and Peter Laird, not the Archie Comics “re-imagining” that the cartoon and pretty much everything that came later—video games, movies, action figures, lunch boxes—was based on. That’s not to say I didn’t get totally into everything TMNT… although I never had a lunch box. Now that I get to do amazing things like figure out the value of imaginary real estate for a living, I, of course, had to evaluate the Ninja Turtles’ home in the sewers, something that has been an integral part of every comic and cartoon version of the amphibian warriors’ adventures. Like the Ghostbusters firehouse, it’s just something I had to cross off my bucket list. 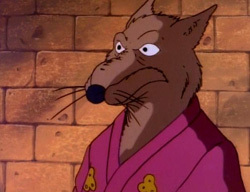 So, when the dust had cleared and all the Foot Clan ninja that stood in my way had been defeated, I’d determined that the home the Turtles share with Master Splinter would cost $11,535,696 if you could actually buy it. Well, if you could buy sewer real estate in Manhattan, to be more specific. More on that in a sec, but first let’s talk about how these things are done. Coming up with the first one is always a lot of fun, so let’s start with that. The first thing I needed to do in order to determine the size of the Turtles’ lair was decide which version of the combination home/hideout/training facility I was going to use. 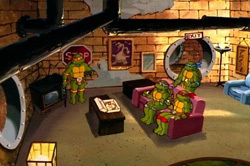 Like I said earlier, various versions of the Turtles have appeared across a multitude of media, and with every incarnation their home is a little—or sometimes a lot—different. So, I turned to the TMNT fan base for help. As it so happens, I found that fan sentiment is strongest for the lair as it appeared in the original animated series—or, as it’s referred to by diehard fans, the “original toon” (OT). 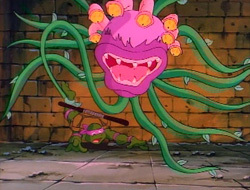 The OT first aired in 1987, which is right around when I first got into TMNT, so its lair happens to be my most fondly remembered, too—even though subsequent series had much more elaborate ones. With that narrowed down, I had to get to measuring. To do that, I tracked down an excellent fan-created forum thread about the layout of the OT lair on The Technodrome, where fellow Turtlephiles had compiled a thorough floorplan based on stills from the cartoon, a map produced by toymaker Playmates Toys, and other sources including a Japanese TMNT magazine. I was a little unsure of how to accurately measure the floorplan at first, since I couldn’t rightly use the average male shoulder width or something like that for scale—after all, these aren’t average males we’re talking about. So, I turned to something I could measure, and could be found in copious supply around the lair: pizza boxes. That’s right—I ended up using the packaging for the Turtles’ food of choice to measure their abode. To do it, I looked up the dimensions of a standard extra-large pizza box (the only size I imagine the bros would order) and found still frames from the show where I could see the 18-inch-wide packages laying near the lair’s round doorways. I determined that the doorways were four boxes wide, or 72 inches, and then used the door sizes on my floor plan to measure the rest of the lair. With the square footage figured out, I figured the tough part was over. After all, every TMNT fan knows they’re based out of New York City, NY, so pinpointing their lair’s location couldn’t be that hard, could it? Turns out I spoke too soon. The Turtles are Manhattanites, born and raised (and mutated), so I could at least start there in my search for their lair’s location. As for the actual neighborhood, I failed to dig up any references to an exact spot where one could find any of the various lair versions (beyond the fact that their house number is 122 and 1/8 in the movies). So, I had to put on my trenchcoat and fedora—just like the Turtles do when they go “incognito”—and play detective. While I didn’t have an address for the green guys, I knew that their news reporter pal April O’Neil—whose apartment they’re known to drop by from time to time—lives at 11th and Bleecker in Manhattan’s West Village, according to a line of dialog from the first TMNT live-action film. I figured they had to live fairly close to there, but exactly where still eluded me. Finally, I stumbled onto a potentially not-so-crazy theory that the “Teenage Mutant Ninja Turtles” was inspired to a degree (some say hugely) by Marvel character Daredevil, because of similarities in their origin stories, supporting characters, and other smaller details. I figured that, if this really is the case, the Turtles’ home neighborhood might be similarly inspired, meaning that their ‘hood could very well be Hell’s Kitchen, the same place Matt Murdock patrols as Daredevil. With my leads exhausted, I decided that this area of lower Manhattan was my best bet, so I set off to research real estate prices in this notoriously rough-and-tumble location. I figured that a place with such a sketchy reputation would be cheap to live in; boy was I in for a surprise. This is the point in the fictional evaluation process when I normally talk about comparable properties, but this time there’s a little something to address before I do that. You see, there aren’t really any comparable properties to the Turtles’ lair because it’s basically a series of rooms in the sewer. Also, while I’m sure some have tried, you can’t actually buy property under the streets of the Big Apple. That doesn’t mean I was giving up; I just had to cheat a little. By “cheat,” I mean that I had to use apartments as my comps. Of course, these don’t come in the range of 10,000 plus square feet, so I had to make do with the largest I could find without venturing in commercial real estate territory. What I found is that, averaging the prices for residential property in several apartment buildings, housing in Hell’s Kitchen still costs a hell of a lot—$1,032 per square foot, to be exact. Despite being shell shocked by that price, I still had to put it all together. For the final step of my ninja training, I simply had to multiply the lair’s square footage (12,420) by its cost per square foot ($1,032) to end up with $12,181,440. Considering this is property in a sewer, I figured that potential buyers—again, if you could buy property under NYC’s streets—would get some kind of discount, so I lopped off 10 percent for a final property value of $11,535,696. Still enormously pricey for where it’s located, but hey, it does have 12 rooms… and one big bathroom. Of course, as with the whole you can’t buy sewer property caveat, I should probably address the inevitable “how did Splinter afford such an expensive home” question. Simple: he didn’t. Essentially, the martial arts master and his adopted sons are squatters, and I doubt that the authorities are going to recognize their rights to the property if they ever find them down there. 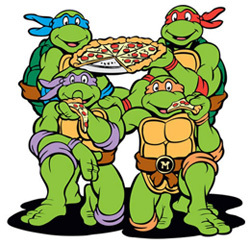 Then again, even if they did have to pack up and move (like they’ve done many times in the comics), they’d be just as at home wherever they wound up—provided there was a TV and plenty of pizza.